NIMBY videoart work made by Debora Hirsch and Iaia Filiberti. The video takes its premises from the recurrent "Not In My Back Yard" syndrome, where we welcome some projects but on condition that are developed away from us. Similarly, while we may repel the events depicted in this video, most of us do not take action as these tragedies happen 'so far away'. NIMBY stresses how these social issues were already fought against a hundred years ago by the thirteen activists selected. Their decrying statements are followed by recent TV reports run by major and minor networks as well as documentaries. 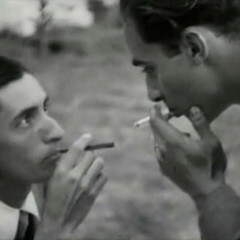 Limite, from director Mário Peixoto, is often considered the high-water mark in the history of Brazilian cinema, and yet it was never commercially released. Hirsch created not one, but three trailers, each using only the original images and sounds of the film, heralding the fictitious upcoming release of the film. 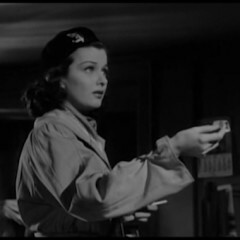 One of the trailers incorporates Hollywood style, another introduces the characters and the basic plot of the film and the third focuses on the director and his thematic intentions. Frame 2 videoart work made by Debora Hirsch and Iaia Filiberti. 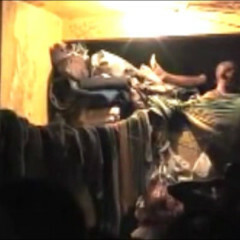 The work has been produced using the found-footage technique. The artists have juxtaposed fragments from old, romantic, mostly Hollywood films. Then they searched the life stories of the lead actors. It turned out that the male actors went on to have a long, happy and successful life. In contrasts, the female leads quickly came to the end of their professional career, some committed suicide, while others became alcoholic. In a simplistic, but poignant way, this gender work demonstrates the unequal chances and possibilities of both genders in performing a role of a love object. 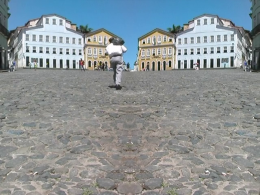 A hypnotic power based on the perpetual motion, imprisoned in the ever post-colonial structure, Uphill opens with a view of an uphill street of metallic grey cobblestones that may recall a Renaissance atmosphere. The slope occupies more than half the image with in the background empty houses that function as theatrical set; meanwhile, a spectral atmosphere hovers over the whole scene, intensified by the haunting music. Suddenly moving figures appear, shown in slow motion, they seem like souls in torment condemned to perpetual motion in an anomalous circle of hell, wanderers in no-man’s land, who do not know their destination. They seem ghosts and they are shot from behind, walking from the bottom to the top, swept away by an ascensional current, absent humanity that does not burden the process of development and industrialization underway because they consume and produce little, they fade into nothing, aware that they will never arrive at the top of the street. The burden of a dead city, illuminated by a cold, chilling light, even if the scene takes place in the middle of the day. 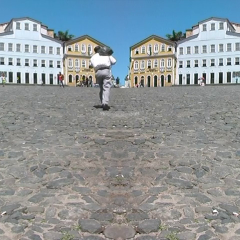 The video ‘Cluster Memories’ was thought to represent the dynamics of memory. 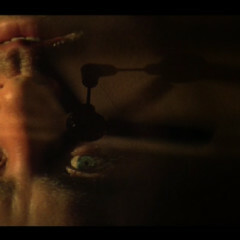 The entire screenplay taken from the movie Apocalypse Now runs fast on the face of the main character, Captain Willard. The script is set as closing credits and imitates the layout of a poem. 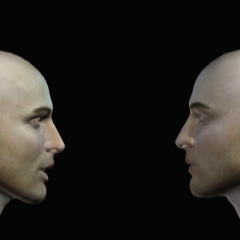 In a short time, with the Doors' soundtrack, the video creates a suspended and oniric atmosphere where the memories seem to overlap. It is not possible to read the entire screenplay, only some fragments. They are the fragments that the public recognises most and that were more strongly impressed in their memories as well as in the memories of the main character of the film. The blink of Willard's eyelids while he stares the fan on the ceiling, the music on the background, all loops in shorter and longer cycles, until the dream wears out. The Last Supper combines contradictions and false myths that can be found in Sao Paulo. The “apostles” are short-lived delinquents, protagonists of a brutal urban life of which they are often the victims. 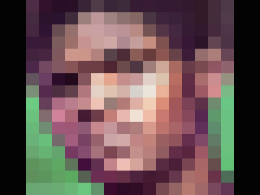 This precariousness of existence is further accentuated by using portraits that are hard to distinguish. 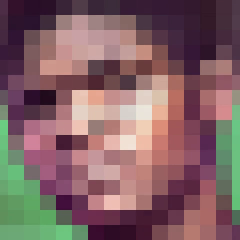 Their features decomposed by the low definition of the pixels, makes both the identification and the identity problematic, and indicates the multiplicity of cases. 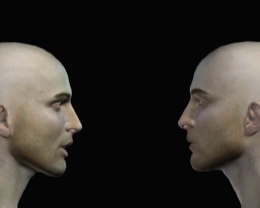 Two virtual profiles, handsome and imperturbable, similar but not identical, are elegantly silhouetted against a plain black ground. They pronounce, alternately, a string of words constructed by identifying, through an electronic dictionary, synonyms of the word that opens the sequence, ethics: ethics, morality, values, principles, beliefs… But the synonyms do not exist. Judgment, verdict, power, influence… Paradoxically, in the rapid progression, the meaning of the words gradually shifts until it has reached the very opposite of ethics: No ethics. The subversive power of evil seems to lie behind the words pronounced. Where attention to differences is lacking, a degeneration of meaning may be produced. But life, history does not proceed in a single direction. Having reached the end, the sequence starts again, beginning from the end: No Ethics, immorality… After the brutal descent, there is a re-ascent, until we return to Ethics, or rather Etix, anagram of Exit. The critical attention of the smallest details, to the worlds of sense and experience that are opened up behind even a single word, may represent the way out.